I warn this isn't an exciting post, I'm so ecstatic to have feel kitchen finished. 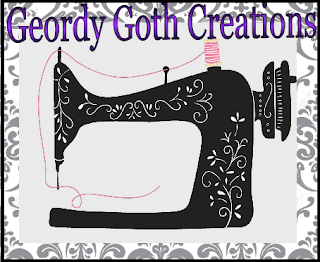 Not very gothic but this is my blog. Lol. As I posted at the beginning of January, (I know its hard to believe tomorrow we'll be in February) I want to organise my house by doing those small jobs and spending some of my savings on the house to get those little jobs done. When I bought the house, I received a generous gift from the bank of Dad, which is also an early inheritance gift. I can never put into words my appreciation of it. Anyway, this money was spent in both my bathroom and kitchen. The previous kitchen was workable, except for the dodgy plumbing that leaked. Not to mention the cooker and boiler were on there last legs. I decided installing a new kitchen would be the best option. Along with replastering, it made a huge difference. TThe kitchen has never felt finished. I've felt disgruntled with the tiled flooring it; the floor always looked dirty, cold on my feet and since I'm a klutz, and I've broken a lot of crockery. I've contemplated whether to paint the floor or ripe the tiles up, however, the Boyfriend wanted vinyl flooring. Originally, I wanted a slate style flooring. Last week, I found an offcut big enough for my kitchen ( my kitchen area is 11sq3 ) for a bargain at £80 at Frank's Carpet. I chose this flooring as was a dark slate with a silver streak, that reflects the light. I like that detail as it follows through with my wallpaper in the living room. The tile floor looks quite similar to my bathroom, which goes with idea making my colour scheme follows through the house. It was fitted yesterday and cost £45. If I installed the flooring myself, it'd taken more time to fit and the overall look inferior. The professionals had the floor installed in twenty minutes. The kitchen finally feels finished, more coordinated and spacious. The boyfriend thinks it because I've cleaned the kitchen up. Disclaimer: I wasn't paid or asked to endorsed this post. Every item I have paid for myself or ( Dad did throught the money he gifted me). I'm just ecstatic to have my kitchen finally finished. I like to create post that may inspire readers creativity. Thanks. I've seen the ikea black cabinets. It looks lovely. You'll have to post about it.It sounds good it's recycled. It looks amazing! You've done a fantastic job! My wife wants to tear out my kitchen and up grade it and expand it, but its workable for now. We need to tackle the bathroom first. I can understand your wife sentiments, I agree with you get the bathroom organised first. With kitchen you could paint it or I would use sticky back vinyal for doors..
Snazzy kitchen! You're right -- the dark slate flooring is the "finishing touch!" Thanks. I'm glad you agree it's changed the whole environment of the kitchen. It’s hard to believe it’s the same kitchen, what a beautiful transformation. Thank you that's so sweet of you to say. Sometimes i can't beleive it myself.I know a lot people have been astonished at the transformation. I can see the pics much clearer on here - it looks amazing, love the black tiles and floor and I can see what you meant about fitting the table in. I also have door envy - the developers ripped all the original doors out of our house grrrr. It was so lovey seeing you again on Thursday, I hope Jack was ok, when you got back. Yeap. I'm not sure if that's the original door or not its hard to tell .Sadly, I think the sixties and seventies ripped out the original Victorian banister, door and plaster detail. I hate the that decades they destroyed some many beautiful period houses. Thanks. It lovely of you to say so. I want something that looked to my likeing but practical. I got a professional in to the tiles. I do love metro tile look. Wow - looking good. Love the new floor, subway tile and counter tops. It all works great together. Thanks. I love the metro tiles.. I've used the white version in my bathroom.